The Drs: What Does Purple Urine Mean? Is There A New Cure For Cancer? Today on The Doctors News In 2:00, The Doctors talked about the new film Words And Pictures, where Juliette Binoche portrays a painter who suffers from rheumatoid arthritis. For someone who makes a living with their hands, the autoimmune disorder can be incredibly debilitating. The Doctors: Lindsay Lohan Taking Drugs? The Doctors talked about what happens when you see purple urine. It turns out it only happens if you are using a catheter and you have a bacterial infection. The urine reacts with the bag to create the color. A gossip website is claiming that Lindsay Lohan could be using illicit drugs, such as molly, despite her treatment at several rehab facilities. The site also says Lindsay Lohan could be claim any positive test for molly as a false positive. News In 2:00 reached out to Lohan for comment, but they hadn’t responded. Certain prescription drugs can cause false positives for illicit drugs, suggesting, but not proving illicit drug use. The Doctors: Cure For Cancer? Researchers at the Mayo Clinic say that a woman with an incurable blood cancer has gone into complete remission after receiving a massive dose of the measles vaccine that was made up of viruses designed to be toxic to the cancer cells. This is the first time that this method has been used on humans to treat cancer. There were only two people in the trial and only one of them was cured after six months, but researchers are hopeful that this method will ultimately provide a cure. 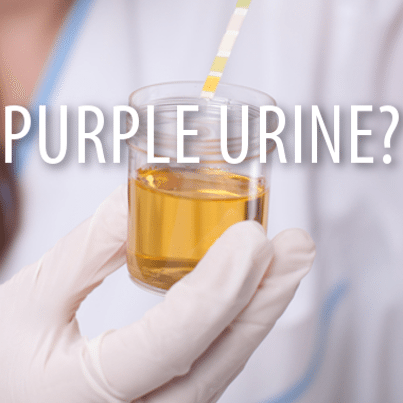 The Doctors: What Does Purple Urine Mean? Dr. Rachael said that the natural color of urine is a nice yellow tint. The more hydrated you are, the lighter it will be. The urine will be orange if you’re dehydrated or if you have a urinary tract infection. If your urine is tea-colored and brown, you should see your doctor. It could be something you ate, like eating a lot of fava beans, but it could be something that’s happening with your liver or your kidneys. But what happens if your urine purple? This is really rare, because it only happens when you see urine in a catheter bag. This indicates that the person has a bacterial infection. What happens is that the red and blue pigments from the infection mix with chemicals in the bag to create purple-colored bag. Dr. Ian Smith said the color of purple urine reminded him of a “Yummy drink.” Gross, Dr. Ian.